The British Gazette » An open letter to Senhor António Horta Osório, Group Chief Executive (CEO) of Lloyds Banking Group. The news that Lloyds Banking Group is preparing to outsource many of its computer systems and over 1,900 jobs to IBM in a deal worth £1.3 billion shows that you and your board are prepared to be imaginative and to think “outside the box” to meet the challenges of the ever changing environment that Lloyds now faces. The need to adapt to the conditions of the future and not seek the established ways of doing things rooted in a past that is forever gone is of course necessary. There is no doubt that the development of IT and the internet will be the tools and the medium that many customers will use to transact their business with their bank. Ensuring a high quality and reliable provision of these resources to customers will secure their long term custom. This entrusting this to a specialist responsible for the entire “chain” from provision of hardware, development, installation and operation of applications software and performing the back office functions along with it will transfer the risk to the supplier whilst leaving the bank to concentrate on what it’s core business is all about: renting and letting money. The key “metric” IBM have to convince you and your fellow directors that they possess – and in abundance – is competence. Without competence IBM will not be able to perform the service reliably. And without this service being performed reliably Lloyds won’t have a business to speak off. As an experienced senior executive you will be aware that you and the board of Lloyds are making much the same decision as did Carnegie. As both a shareholder and a customer of Lloyds, I sggest that since you have followed in Carnegie’s footsteps you should continue and watch IBM very closely. Very closely indeed. NB: We have chosen the image at the top of this article with deliberation. 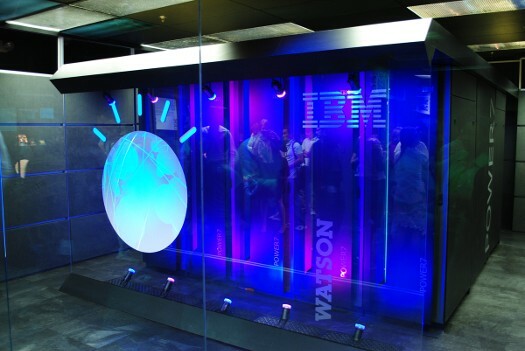 It is a photograph that IBM procured of their super computer “Watson”. It is to be hoped they did not pay the person who took it any money as for a professional it is a completely incompetent work! Faced with highly reflective glass at all points of the compass and people hanging around – who are not wanted in the shot – an untrained amateur would find this shot almost impossible to produce properly – without reflections! As a former professional photographer, this was something I had to be able to do. That IBM can allow such an amateurish effort through their services inwards section speaks volumes I think!